Fermanagh Times July 1st, 1915. 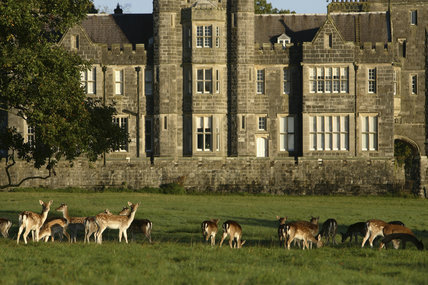 CROM CASTLE. Owing to recent events the Crom Demesne with the exception of the Old Castle and the direct road thereto, which is indicated by notices, is closed to the public until further notice. The public may visit the Old Castle on Fridays, but special permission must be obtained for large parties and pic– nics. Horse drawn vehicles and carriages must, after depositing visitors at the Old Castle, leave the Demesne and only return when required by the visitors. Motors, motor cycles, and bicycles can remain outside the Old Castle. All grounds including the Old Castle and Gad Island are as usual closed to the public on Sundays. Fermanagh Times July 1st, 1915. THE SCENIC BEAUTIES OF FERMANAGH. A large party of Southern Pressman are just now journeying through our Northern Provence with the view of describing its scenic attractions to the further development of the tourist traffic. Northern Journalists are after making a like pleasant pilgrimage to Southern picturesque resorts. Why has Fermanagh not been included in the Ulster Districts? Who was responsible for the itinerary? We notice that the arrangements have been made under influential auspices including those of the Lord Mayors of Belfast and Cork. The reception and gatherings have shown that the movement is a solid one, practical, and really devised to do good to the country. Why, then, was one of the most charming lake and mountain counties altogether omitted from the visiting programme? Very possibly Fermanagh has only itself to blame for being out of most of the enriching and distinguishing activities that mark more enterprising and pushy communities. Our people want to waken up to a better knowledge of their own possessions. We want first to get a knowledge of them ourselves, to learn how to appreciate and value them and then to extend that knowledge and appreciation as far afield as possible. Meanwhile we suffer from our own supineness. Fermanagh Times July 1st, 1915. THINGS PEOPLE WANT TO KNOW. Is the White Hart Entry, Townhall Street, Enniskillen, now become the most disordered the part of the town? Why are we now hearing so very little about the two million pound electrical lighting scheme which was (or is?) to be started at Belleek? Would one’s money be better invested in that or in the War loan? Fermanagh Times July 1st, 1915. WAR NEWS. Among the officers included in the recent casualty list is Lieutenant R. K. Lloyd, of the 10th King’s Liverpool Regiment (Liverpool Scottish), who is reported wounded. Lieutenant Lloyd is the brilliant Portora half, who captained Ireland last season and was associated with the wonderful triumphs of the great Liverpool Rugby Football Club. With him in the Liverpool team were Lieutenant W. R. Poulton–Palmer and Lieutenant F. H. Turner, the English and Scottish captains, both of whom have been killed in action. We noticed with very great pleasure that Captain Maurice F. Day, 2nd King’s Own Yorkshire Light Infantry, who is the youngest son of Right Rev. Dr. Day, Bishop of Clogher, of Bishopscourt, Clones, has been awarded the Military Cross. Captain Day is adjutant of his battalion, and has been twice mentioned in dispatches. Fermanagh Times July 1st, 1915. WAR NEWS. Since the middle of last August never a day has gone by without the names of Ulster Volunteers appearing in the casualty lists. Even in the so-called Irish Division which went to England a few weeks ago, amidst Mr. Redmond’s demonstrations of joy, over a third of the men are Ulster Protestants, and another third are English Protestants. Our Ulster Division was equipped and clothed by local enterprise at no trouble to the military authorities and with a notable saving of expense. This was the work of a few businessmen associated with the headquarters of the Ulster Volunteers. It is hardly necessary to mention the splendid work which is being done in our shipyards, which Mr. Lloyd George publicly stated were the most satisfactory in the kingdom. Similarly our great textile resources have been freely placed at the disposal of the Government, and in no class of work has there been any trouble between employers and workers, thanks to their mutual common sense and patriotism. No doubt we shall have again as before whining about the large number of old men to be found in Ireland. We have no desire to deal with such persons. We direct attention solely to men of military age. Of these one and four has enlisted in Ulster, when only one in 17 has enlisted in the three Nationalist provinces. If we were to omit the Nationalist counties of Ulster where the recruiting has been very poor, it would be seen how magnificent has been the Unionist response to the call for men. At the same time we have never been slow to admit that those Nationalists who have joined the colours fought magnificently. They are a credit not only to Ireland but to the whole Empire. A hospital ship arrived in Dublin on Sunday morning from France with 731 wounded soldiers, of whom 230 were lying down cases. 300 of the men were sent to Belfast, and the remainder stay in Dublin. The miners are the most Radical and Socialists of the Labour section of the country, of course, the most adverse to being compelled to increase the output of coal. They object even to be brought under the terms of the Munitions Bill. This is probably because all the miners who are patriots have gone to the front, and only those who are not – only Socialists and Radicals – are left. Fermanagh Times July 1st, 1915. THE GENERALSHIP AND THE SOLDIERSHIP OF THE RUSSIANS HAVE BEEN MAGNIFICENT, but, as Mr. Lloyd George remarked, and it is a only stating the obvious, the best and bravest of troops can be of little avail unless they have guns and ammunition to use against the enemy. It is, we are convinced, in the failure of these, and not in strategy or courage, that the Russians have failed. It is a lesson and a home lesson, for all our workers that they must be up and doing, working in season and out of season instead of striking and slacking if our own troops are not to fall in the same way and fail for the same cause. In two ways lack of British munitions is responsible for the Russian losses in Galicia. We were unable to supply our Ally with shells, and our own want of machine guns and high explosives in the West enabled the Germans in the middle of April, to transfer some part of their western forces to the Eastern theatre. The Government conceal these things from us so long as concealment was possible, and it is small wonder that the comparatively sudden realization of our mistakes, and of their costly consequences, has depressed many minds. Impartial Reporter. July 1 1915. FERMANAGH AMBULANCE. Next week the motor ambulance ‘Fermanagh’ will be on tour through the county, and people will have an opportunity of viewing it. It has cost £550, the funds being collected by Mr. E. M. Archdale, D. L. The ambulance will go to the Ulster Division which will have 21 motor ambulances, all provided by public subscription. Many other divisions have no ambulance of their own. Impartial Reporter. July 1 1915. BITS AND PIECES. Dundalk Prison has been added to the list of closed prisons in Ireland. The fruit trees and potato crops in of the west of Ireland have been destroyed by frost. At Chicago on Saturday, Davio Resta won the 500 mile automobile race at an average speed of 97.6 miles per hour. This is stated to be a record. The Noxious Weeds Act was sought to be put into force at the Tyrone Committee of Agriculture, but failed. Irish ‘farmers’ prefer weeds to the trouble of extirpating them. Our proverbial laziness or indolence prevents us keeping our fields and fences as tidy as they should be. Impartial Reporter. July 1 1915. TURKS PAINT THEMSELVES GREEN. Lieutenant Colonel Leslie Wilson, D.S.O., M.P. writing from Gallipoli says: – ‘The Turks are brave and clever snipers. The frequently place small trees on their back and crawl up to the trenches. I watched a rush which seemed to be shaking a lot although there was no wind then I and another man got on to it with rifles. It moved quickly enough then. Some of the Turks paint themselves and their rifles green, and are practically invisible. Impartial Reporter. July 1 1915. FUNERAL AT ENNISKILLEN. The remains of Sergeant Major Hall of the 4th Inniskilling Fusiliers where interned at Enniskillen on Friday afternoon with military honours. Deceased, who had been in the army for a number of years, and served through the South African war, was well known and highly respected in Enniskillen, where he had been stationed for a number of years. Deceased had undergone an operation and complications followed, terminating fatally. The cortege was headed by the bands of the 4th Inniskillings stationed at Buncrana, and the funeral was also attended by a company of men from the unit under the command of Captain W. G. Nixon. The coffin was wrapped in a Union Jack and was borne to the Roman Catholic cemetery. The deceased had been a member of the Church of England and was attended by Canon Webb just before his death, but he was buried in the Roman Catholic burying ground according to the rights of the Roman Catholic Church, his wife being a member of this church. Impartial Reporter. July 1 1915. ARMS AND AMMUNITION IN ULSTER. Mr. Ginnell (N). asked the Under Secretary for War if he would say what quantity of the arms and ammunition privately imported into Ulster in 1913 and 1914 had been placed at the disposal of his Majesty’s Government for the purposes of the war; by whose authority and for what purpose stores of arms and ammunition were kept in the mansions of certain landlords in Ulster; and what action the Army Council proposed to take regarding them. Mr. Tenant – No arms and ammunition reporting to have been imported into Ulster during the period mentioned have been placed at the disposal of the War Office. I have no information on the second part of the question, and I am not aware that any action is called for. Impartial Reporter. July 1 1915. Fermanagh Gaelic Feis. (Contributed.) It was remarkable that the numbers present were smaller than usual, but still the grounds of the Technical School were well filled with comely maidens and many stalwart young men who might well have been expected to have been filling the ranks of the army. The number of entries was about the usual. The Feis although interesting and deserving of more encouragement, was somewhat monotonous from the limited and undeveloped nature of its competitions. Dancing seemed to evoke most interest, and the little girls looked pretty as they went through the unemotional evolutions of the Irish folk dances which strange to say, are unemotional, and appeared to lack life and colour in comparison with the Russian, Spanish, or even Morris traditional dances; yet to be truly Irish they should be altogether unemotional. The clear voices in the choral competitions were very pleasant. The dramatic recitations in Gaelic did not attract much interest, as the words had not the musical assistance which enlivens a performance so much. In the history competitions, the amount of knowledge shown was rather disappointing, even the battle of the Boyne seeming a misty subject to some. It was amusing to watch a child when asked its candid opinion of James 11 hesitate between his real opinion and what it thought might be the required answer. A girl about 15 was asked whether she thought the violation of the Treaty of Limerick or of Belgium’s independence the greater crime. After a few moments thought she replied the violation of Belgium, and her examiner seem to be well pleased with her answer, although his partner did not seem to agree with that opinion. Impartial Reporter. July 1 1915. AN INNISKILLINGS KILLS EIGHT GERMANS. A comrade writing home to his mother in Limavady alludes to Private Robert McLaughlin, 2nd Royal Inniskilling Fusiliers by first stating – If every man killed as many Germans has Bob McLaughlin, the war would soon be over. The letter narrated a hot time a small detachment of the 2nd Inniskillings had somewhere in France. This small handful of men had taken possession of a house, and as they were being subjected to heavy shelling, their position soon became untenable, as the masonry was falling all round them, and it was decided to clear out. Just after emerging from the shattered building a German machine gun began to rake the little band of Inniskillings, and all the officers were shot down. Led by Private Robert McLaughlin the men charged the machine gun and captured it, all its team been stricken down. McLaughlin, who had a number of hand grenades, hurled them with the unerring aim as he advanced and killed 8 Germans. It is hoped that his gallantry will be recognized although no officers were present to witness it. McLaughlin was a reservist and proceeded to the front last November. Impartial Reporter. July 1 1915. DUELS IN THE AIR. A THRILLING STORY. THE AEROPLANE IN FLAMES. On Friday June 18 there were two engagements in the air on this day. Near Roulers one of the British machines on reconnaissance duly encountered a hostile aeroplane, and after a machine gun duel, forced it to descend hurriedly to earth. A combat with machine guns at a height well over a mile above the earth’s surface, though now not uncommon, may be considered to provide some excitement, but on the same day two other officers of the Royal Flying Corps had a still more exciting experience. While reconnoitring over Poelcapelle at a height of about 4000 feet they engaged a large biplane having a double fuselage, two engines and a pair of propellers. The German machine at first circled around the British shooting at it with a machine gun but so far as is known not inflicting any damage. Then the observers fire about 50 rounds in return at under 200 yards range. This had some effect for the hostile biplane was seen to waver. After some more shots its engine stopped and its guns stopped and its nose dived to the level of 2,000 feet, where it flattened out its course, flying slowly and erratically under heavy fire from the antiaircraft guns below.. The pilot turned towards the British lines to complete his reconnaissance when his machine was hit and he decided to make for home but the petrol tank had been picked and as the aeroplane glided downwards on the slant the petrol was set alight by the exhaust and run down the front of the body of the aeroplane which travelled on to the accompaniment of a rattle of musketry as the unexpended rounds of the machine gun ammunition exploded in the heat and those in the pilot’s loaded revolver went off. The pilot however did not lose control and the aeroplane proceeded steadily on its downward course. Before it reached the ground a large part of the framework had been destroyed, and even the hardwood blades of the propeller were so much burned that the propellers ceased to revolve in the rush of air. When the machine finally landed behind the British lines both officers were severely burnt and the pilot on climbing hurriedly and of the blazing wreck tripped over a wire stay, fell, and sprained his knee. Impartial Reporter. July 1 1915. THE DEATH OF REV. MR. MITCHELL. HIS WORK, HIS LIFE, HIS CHARACTER. The rather sudden illness of the Rev. S. C. Mitchell, Presbyterian minister of Enniskillen terminated rather unexpectedly in his death early on Thursday morning last about 1.00. It came as a shock to the community and only comparatively few had been aware of his illness. The Rev. Samuel Cuthbert Mitchell was instituted as minister of the Enniskillen congregation 33 years ago in succession to the Rev. Alex Cooper Maclatchy, M. A., and during his pastorate the present new church in East Bridge Street which was opened in 1897 was provided, and the Manse built. Of the 25 members of the congregation who had signed the “call” 33 years ago only three remain, Mr. James Harvey, Mr. Thomas Wylie, and Mr W. Copeland Trimble, so great have been the ravages of time. He went to Leghorn in Italy as pastor of the Scots church there and when he returned a great change was noticed in his voice and appearance, not for the better – he appeared to have aged; but he was unconscious of any decadence in health and spirits and spoke of feeling younger and brighter than before. Impartial Reporter. July 1 1915. A SLANDER ACTION. A HUSBAND IS RESPONSIBLE FOR HIS WIFE’S TONGUE. This was held in Fermanagh County Court on Saturday the plaintiff being Mrs. McCaffrey, Sessiagh and the defendants Thomas Owens and his wife Annie Owens. The plaintiff said that she married 16 years ago to Owen McCaffrey and had no children until the 18th of April last. It had been told to her and that the child was not her husband’s. Andrew McManus said that on the 31st of March Mrs. Owen told him that the plaintiff’s husband was not the father of her child but mentioned another man as the father. On different occasions before that she told him the same story and this became general conversation all over the country. Maggie McManus on the 14th of August detailed several conversations with Mrs Owens. In cross-examination the witness denied that she was ever put out of houses in the country for carrying stories. His Honour said that he was satisfied that the evidence of McManus was true and there must be a decree and the only question was the amount of the decree. The decree would fall on the shoulders of Thomas Owens, who was comparatively innocent, but he was liable for his wife’s torts which is one of the privileges of married life. The costs in that case would be very severe and he would be inclined to give heavy damages if it were not for the fact that the costs would be heavy and amount to between £10 and £20. This action was only brought to get rid of this very scandalous annoyance and the plaintiff did not want heavy damages. All she wanted was clear her character and put a stop to these imputations and as Thomas Owens met the case very firmly and was a decent sort of man, the damages would be only £3 and costs. Impartial Reporter. July 1 1915. FERMANAGH LADIES DEMAND CONSCRIPTION. SHOP ASSISTANTS CRITICISED. RECRUITING COMMITTEES A FAILURE. 11 ATTEND OUT OF 40. Some weeks ago the Central Recruiting Committee in Fermanagh acting under instruction from headquarters, appointed a Ladies Recruiting Committee, to assist in the campaign to get men for the army. To further develop the scope of this committee it was decided to ask the ladies of the Central Committee to appoint subcommittees and accordingly a meeting was summoned for Tuesday last when only 11 attended. Mr. J. Collum, H. M. L. explained the object of the meeting and said that it was thought that Ladies Committees could do a lot more good than men. There were he continued a lot of shop assistants and certainly it was not man’s duties to be in shops at the present moment when girls could take their places and amongst these the ladies would have influence. Of course proprietors of shops should give them every encouragement and undertake to take back after the war any assistant who enlists. Among the comments made – Mrs. E. M. Archdale – “The women are as bad as the men. I point out that I have four sons serving, and the reply is – it is different for the quality.” Mrs. Column – “the farmers’ sons have done the worst at the present crisis.” A unanimous resolution was passed stating that the time has now arrived that some scheme of conscription should be put in force in this country. Fermanagh Herald July 3rd. 1915. ANGLING ON THE ERNE. THE LORD LIEUTENANT IN BALLYSHANNON. For the week ending Saturday, the 26th of June the fishing has been very good at Ballyshannon. Mr. Glynn had 19 salmon and grilse from 4lb to 17 ½ pounds. Lough Melvin for the week ending 26th inst., Mr. J. Gallacher took 15 Gillaroo and sonaghan trout weighing 10 ½ pounds on the 24th. Many anglers over the lake caught between 10 and 20 trout. On Monday Lord Wimborne, the Lord Lieutenant spent the greater portion of the day angling for salmon in the Erne from Ballyshannon Bridge. Fermanagh Herald July 3rd. 1915. IT IS ANNOUNCED THAT LIEUTENANT-COLONEL SIR JOHN MILBANKE, BART., V. C., commanding the Notts Yeomanry, has been killed in action at the Dardanelles. Sir John, who succeeded to the baronetcy in 1899, was married in the following year to Amelia, daughter of the Hon. Charles Frederick Crichton, eldest surviving brother of the late Earl of Erne. Lady Milbanke’s only brother, Major H. F. Crichton, of the Irish Guards was killed early in the war. Sir John Milbanke was born in 1872, and served in the 10th Hussars, retiring with the rank of major in 1911. He rejoined last October and was posted to the command of the Notts Yeomanry. During the Boer War he was A. D. C. to Sir John French, and was seriously wounded. It was in that campaign that he won the VC for gallantry, rescuing a wounded trooper after he himself had been seriously injured. The baronetcy dates back to 1661, and a daughter of a previous holder of the title was the wife of Lord Byron. Fermanagh Herald July 3rd. 1915. THE VALUE OF THE HOLY MASS. At the hour of death the Masses you have heard will be your greatest consolation. Every Mass will go with you to judgment and plead for pardon. Every Mass can diminish the temporal punishment due to your sins, more or less, according to your fervour. The power of Satan over you is diminished. You afford of the souls in Purgatory the greatest possible relief. One Mass heard during your life will be of more benefit to you than many heard for you after death. You shorten your Purgatory by every Mass. Every Mass wins for you a higher degree of Glory in heaven. You are blessed in your temporal goods and affairs. Fermanagh Times July 8th, 1915. FACTS AND FANCIES. THE VICTORIA CROSS. The Victoria Cross was first established in 1856 and is awarded for conspicuous bravery on the part of naval and military officers, and of any member of either service who has done a brilliant deed in the face of the enemy. The badge is a plain crosse-patee in bronze with straight bounding lines, and is attached by the letter V to a bronze bar laureated. The centrepiece is a lion and upon an Imperial Crown with “For Valour” inscrolled below. The bar bears on the reverse the name and rank of the recipient, and the cross the name and date of the distinguished action or campaign. In the case of the Army it is suspended from the left breast by the Garter-red ribbon and in the Navy by a blue ribbon. It carries with it in the case of non–coms and privates a pension of £10 a year, £5 being added for each bar. Although the intrinsic value of the decoration is but fourpence, its wearer must be saluted by all members of the services no matter what their rank. Fermanagh Times July 8th, 1915. “A GHASTLY AFFAIR.” A DONEGAL TYPHUS OUTBREAK. A serious outbreak of typhus fever has occurred in the Dungloe district of Donegal (the County, which has provided fewer men for the war than any other in Ireland), and at Saturday’s meeting of the Glenties Rural Council it was stated that six patients were in the fever hospital attached to the institution. One man afflicted with the disease had died under horrible circumstances in his own home. Dr. C. E. R. Gardiner reported that one of the patients died on Thursday. He wired to the relieving officer, to bury the body. When the coffin arrived on Friday, the doctor and a nurse put the body into it and placed it outside the house, where it remained until about 1.00 on Sunday morning, when, owing to the failure of the relieving officer to do his duty, the doctor and two nurses dug a grave and buried the body in a field near the house. This was not the first time, the doctor added, that they had to bury a fever infected corpse, but it would be the last. As there was nobody in the house to do anything but a decrepit old woman and a girl of 13 years, we asked relatives and neighbours to leave milk, turf, and water on the roadside. With great ado the nurses managed to beg a sufficient quantity of milk, mostly sour, but how they managed for turf and water is a puzzle to me, as nobody would bring them either. There were some cattle about the place which the relatives were very anxious about, thinking that the nurses and I should attend to them. It seemed not to matter that human beings should die and rot above ground as long as the cattle were all right. On Tuesday when the three patients were convalescing and the ambulance had been ordered to take them to the fever hospital, a brother of the patient arrived on the scene, assaulted the nurses, frightened the patient’s by shouting and falling over their beds, and was only induced to leave the place when the police arrived. Next morning, when the police had gone, he reappeared and commenced the same antics. By threats of imprisonment under the Public Health Act I induced him to go with the fever ambulance. We burned the bedding, clothes and the fowl that died of the fever. The byre is in an extremely filthy state, and the house swarming with vermin, and ought, in my opinion, to be burned. The whole ghastly affair is an almost incredible example of cruelty, selfishness, and cowardice which it is humiliating to think could occur in Ireland in the 20th century. Fermanagh Times July 8th, 1915. THINGS PEOPLE WANT TO KNOW. Has not Captain J. G. Porter, Belleisle not covered himself, his family and his native county with honour by his gallantry in the present war? Is there not likely to be another Local Government inquiry and a clearance in Lisnaskea Workhouse over the constant bickering’s going on there between officials? Has the Scottish Co-operative Wholesale Society not set a wonderfully good example to other great business firms by investing no less than £250,000 in the War Loan? Does the condition of the lake at the East Bridge, Enniskillen at the present time not constitute a scandal? Fermanagh Times July 8th, 1915. FERMANAGH MEN REWARDED FOR GALLANTRY. Captain John Grey Porter, 9th Queen’s Royal Lancers, a son of Mr. J. Porter Porter, of Belleisle, and who has been twice wounded has also been made a Companion of the Distinguished Service Order. How he won the coveted honour is officially recorded: – “On 10 May, 1915, when a very heavy attack was made on the front line near Hooge, Captain Porter went up to the infantry line there, and brought back very valuable information regarding the situation. On the 13th of May he rendered the greatest possible assistance in taking messages under terrific shell fire to various parts of the line, and reporting on various local situations. He set an example of coolness and total disregard of danger that was beyond all praise. He had been twice wounded previously in this campaign. Major Charles William Henry Crichton, 10th Prince of Wales Own Royal Hussars, has been made a Companion of the D. S. O. for gallantry which is officially described as follows: – Near Ypres, on the 13th of May, 1915, showed conspicuous gallantry and ability in collecting and rallying men who were retiring under heavy shell fire through the 10th Hussars position. In our counter attacks he continued to direct operations, giving great encouragement to his men as he lay in the open under heavy shell fire with his leg shattered. Fermanagh Times July 8th, 1915. OBITUARY. REV. A. BEATTIE, IRVINESTOWN. The death of Rev. Archibald Beattie which took place at Irvinestown on Monday cast a gloom over the town, and the news of his demise was heard with heartfelt regret by a wide circle of friends and acquaintances in the neighbourhood. For 32 years the deceased gentleman laboured with much acceptance in the Irvinestown district and since he was installed in the Presbyterian Church there he has enjoyed the respect and esteem of a devoted congregation and all creeds and classes regarded him as one whom respect was a duty, and his acquaintance was a privilege. He was ordained as a minister of the gospel in May 1876 and he was installed in Irvinestown in May 1881. Though he resigned from active duties about four years ago, he took a deep practical interest in Church work up to the time of his death, and the welfare of the congregation of which he had so long been pastor was to him a matter of deep concern. Fermanagh Times July 8th, 1915. A FARMER ASSAULTED. John Magee, a farmer of Trustan, charged a young fellow named Patrick McCloskey, of Brookeborough, with assault on the 28th ult. Plaintiff described his movements in Brookeborough that night, and on his way home he was overtaken by the defendant at Mr. Rainbird’s gate. They had some words about witness allowing his servant girl to go to a football match and afterwards about some wood the defendant had bought in Enniskillen to make a press for the priest vestments. Defendant then shoved witness into the hedge and beat him severely. The defendant was fined 10 shillings and sixpence and three shillings and sixpence cost or in default a week’s imprisonment. The meeting started punctually at the hour fixed and there was a large attendance, but although every house in the district where there were two or more available men of military age was communicated with by circular acquainting the house holders of the time and object of the meeting that turnout of likely young men was disappointing. The village of Kesh itself has sent a practically all its sons to the various camps, but we were informed, the country round can do a great deal better. In fact we were told that with the exception of several men who had been in the North Irish Horse there were very few in the district round about who had joined the colours. The earlier part of the day was showery and the meeting had scarcely been opened when rain fell heavily and continued till the end when the clouds rolled away and a beautiful evening followed. Colonel Leslie who is in command of the 12th Battalion at Finner Camp said that the last time he spoke in his own village of Pettigo they did not obtain one single recruit and he hoped that day the Kesh district would be shame his own village by at least getting one man into Kitchener’s Army. “Think it over, men of Fermanagh,” concluded Colonel Leslie, “you’re in absolute danger, the British Fleet once destroyed we’re done; our armies are fighting gallantly, but they are making no progress whenever, and they are just where the where months ago. I am glad to hear the farmers are making money, but if the Germans come here they are only making money for the Germans to spend. Think it over men of Fermanagh and join the great and glorious army of King George the Fifth. (Loud cheers.) We understand that four recruits were obtained and it must be admitted that this is but a poor recompense for the energy and forethought displayed by the Kesh Committee, the members of which deserve the warmest congratulations for getting together so many representative and influential speakers and for the manner in which all details were looked after during the day. Fermanagh Times July 8th, 1915. WAR NEWS. Private James Quigley, Dublin Fusiliers, son of Mr. Patrick Quigley, Clones, is reported to have been killed in action. His brother Owen, who served in the trenches throughout the winter has been invalided home. The unofficial report of the death in action of the Private John Roy, Irish Guards, has been officially confirmed. He was a native of Clones, and his brother is serving with the colours. Private Stephen Johnston, son of Mr. Robert Johnston, Clones, who enlisted in the Irish Guards after the outbreak of war, and has been missing since the 18th of May, is now unofficially reported killed. Impartial Reporter. July 8 1915. NOTES. Mr. Harry Lauder the great Scottish comedian has applied for £10,000 of the War Loan. The Scottish Co-operative Wholesale Society has subscribed £250,000. Drinking by soldiers’ wives is said to be less excessive than ever in England. The total British casualties at the storming of Dargai, the charge of Balaclava, the battles of Omdurman, Waterloo and Magersfontein, were in the aggregate 8,480. Up till recently our losses in the Dardanelles were 38,636. Trillick. Longevity in a cat. “Old Girl” is the pet name of a celebrated mouser belonging to Mr. and Mrs. Stafford, Ivy Cottage, seems to be a most appropriate title. He is 27 years old and is still doing faithful service in the third generation of that family. All her teeth are gone except three. Impartial Reporter. July 8 1915. RECRUITING AT KESH. THE CALL TO ARMS. THE VISIT OF THE DEPOT BAND. Monday last being Kesh fair day a recruiting meeting was held on the village for the purpose of trying to bring home to the people of the district the realities and needs of the present great war. Fewer recruits in proportion to population have perhaps gone to the army from the Kesh district, than any other Unionist portions of Fermanagh, and the recruiting committee for the district up to this have had a poor response to their appeal. Before the meeting the band from the depot paraded the village under Mr. Ramsay band master and attracted many young people in its wake. Colonel Stewart of the Depot declared that the farmers’ sons had not done as well as they might. Mr. John McHugh, J. P., Chairman of the County Council, took exception to this statement, and in a capable, patriotic address, gave examples of how the farmers’ sons had recruited and the difficulties under which they laboured. If the government did not get sufficient men, he declared, the only means that were left to them was compulsion. A half a dozen recruits for the 12th (Reserve) Inniskillings were secured. Impartial Reporter. July 8 1915. INNISKILLING OFFICERS AWARDED THE D.S.O. Their Distinguished Service Order has been awarded to the following officers: – Captain Edward William Atkinson, 1st Batt. Royal Inniskilling Fusiliers. On the 2nd of May, 1915 during operations south of Krithin, for gallantly leading a counterattack capturing a Turkish trench 300 yards to his front and for the efficient command of his battalion, all the senior officers having become casualties. Captain Cecil Ridings, 1st Batt. the Royal Inniskilling Fusiliers. On April 28, 1915 during operations the south of Krithin, for exceptionally gallant and capable leading under difficult conditions maintaining a forward position in spite of heavy losses at a critical moment, though unsupported on either flank and being himself severely wounded. Impartial Reporter. July 8 1915. GALLANT FERMANAGHMEN AWARDED THE D.S.O. This is one of the highest awards that can be granted an officer for service in the field and has been awarded to two Fermanagh officers Captain John Grey Porter, 9th Queen’s Royal Lancers for on the 10th of May, 1915 when a very heavy attack was made on the front line near Hooge, Captain Porter went up to the infantry line their and brought back very valuable information regarding the situation. On the 13th of May he rendered the greatest possible assistance in taking messages under terrific shell fire to various parts of the line, and reporting on various local situations. He set an example of coolness and total disregard of danger that was beyond all praise. He has been twice wounded in this campaign. He is a son of Mr. J. Porter Porter, of Belleisle, County Fermanagh. Major Charles William Henry Crichton, 10th (Prince of Wales Own) Royal Hussars. Near Ypres on the 13th of May, 1915, showing conspicuous gallantry and ability in collecting and rallying men who were retiring under heavy shell fire through the 10th Hussars position. In our counter attacks he continued to direct operations giving great encouragement to his men when he lay in the open under heavy shell fire with his leg shattered. Major Crichton is the eldest son of the Honourable Henry George Louis Crichton, K.C.B, and a brother of the fourth Earl of Erne. Impartial Reporter. July 8 1915. DARDANELLES LOSSES. Mr. Asquith in the House of Commons on Thursday said the naval and military casualties in the Dardanelles to the 31st of May were as follows: – killed 496 officers and 6927 men. Fermanagh Herald July 10th. 1915. AN EX-PAUPER EARNS £15 A WEEK. THE WORKHOUSES ARE EMPTIED BY THE WAR. “There are less men in the workhouse today than there have been for the past quarter of a century, and probably for a much longer period than that”, said the master of a large workhouse to a London to Daily Chronicle representative. “In my own case I have not a single able-bodied man here. Since the war began several hundred men of every age and condition, have gone out and got work and well-paid work too. Men who have done no work for many years may now be found doing munitions and other work and earning good wages. Enquiries made at many metropolitan workhouses confirmed the statement. The able-bodied male pauper –and often the pauper who is not able bodied has vanished. He has reappeared as the ordinary honest and industrious workmen, driving his van or shouldering his tool bag in a manner he is not known for years. In the East End, the Daily Chronicle representative was informed there is a man of over 60 who, until recently, was a pauper receiving outdoor relief. His Christmas dinner was provided by a charity, but he subsequently got work in a munitions factory, and is now earning sometimes as much as £15 in one week. The ex-pauper, amusing to relate, has acquired the habit of smoking cigars – and also of outing his own acquaintances in the street. Fermanagh Herald July 10th. 1915. POSSIBLE BOOT SHORTAGE. The demand for army boots has affected the ordinary trade in this country, and the result will be a smaller range of footwear and much advance prices and the disappearance of the lower priced boots, says the Daily Mail. There is prospect of a shortage in civilian footwear. Already boots cost an average of three shillings more a pair. A Northampton manufacturer confessed the other day that he was experiencing no difficulty in securing advanced prices. The only trouble is in filling orders. Very few new samples are being shown, and these are mostly boots which can be handled concurrently with army orders. Special work, though very highly priced, is discouraged. Fermanagh Herald July 10th. 1915. FOUR STEAMER ARE SUNK BY GERMAN SUBMARINES. For more vessels have been sunk off the Scilly isles by a German submarines – the London steamer Richmond (3,214) tons from Queenstown to Boulogne, the Belgian steamer Bodugant (1,441) tons from Bayonne to Barry; the Leith steamer Craigard (3,286 tonnes) from Galveston to Harve; and the steamer Gatsby (3,497) tons, Cape Breton for London. Fermanagh Herald July 10th. 1915. JOTTINGS. Private Stephen Johnston, son of Mr. Robert Johnston, Clones, who enlisted in the Irish Guards after the outbreak of war, and has been missing since the 18th of May, is now unofficially reported killed. The unofficial reports of the death in action of Private John Roy, Irish Guards, already reported has been officially confirmed. He was a native of Clones and a brother of his is serving with the colours. Private James Quigley, Dublin Fusiliers son of Mr. Patrick Quigley, Clones, is reported to have been killed in action. His brother Owen, who served in the trenches throughout the winter, has been invalided home. Mr. Patrick McDermott, of Newtownbutler, has been notified by the War Office that his son, Private Mark McDermott, of the second Battalion Royal Inniskilling Fusiliers, is missing since the 16th of May. He joined the army immediately after the outbreak of war, and has seen much service in France and Belgium. Fermanagh Herald July 10th. 1915. THE WAR LOAN. BIG SUBSCRIPTIONS. FIVE MILLION POUNDS FROM GUINNESS. Today brings a number of notable subscriptions to the War Loan. They are Messrs. Guinness & Company £5,000,000; Imperial Tobacco Company of Great Britain and Ireland, one million; United Tobacco Company, £50,000; Bath City Council – practically the whole of its sinking fund, amounting to £50,000; Northampton Town Council – All the available funds, approximately £16,000. Fermanagh Herald July 10th. 1915. A GREAT ACTIVITY ON THE WESTERN FRONT. A REPORT FROM SIR JOHN FRENCH. Since my last report there has been no change in the situation on our front. Fighting has been mainly confined to intermittent artillery duels, of which a feature has been the employment by the enemy of a large quantity of gas shells, particularly in the neighbourhood of Ypres. During this period the enemy has exploded eight mines at different points of our front without any damage to our trenches. On the other hand, on the 30th of June we blew in 50 yards of the enemy’s front line north of Neuve Chapelle. An evening of the 4th of July, north of Ypres, a German sap was blown in by our artillery fire and a platoon of infantry advanced to complete its destruction. The few Germans who survived the artillery bombardment were driven out by the bayonet, and a machine gun in the sap was found to be destroyed. Our casualties were insignificant, and the platoon returned practically intact to its own trench, having completely succeeded in its mission. Fermanagh Herald July 10th. 1915. CLONES MAN MENTIONED IN DISPATCHES. In the list of those mentioned in Sir John French’s dispatches occurs the name of the Clones man, number 64880, Private Reuben C. Farrell, A Company, 1st Battalion Royal Scots Fusiliers. Private Farrell has seen service in the Boer war, for which he holds decorations, and has distinguished himself for bravery in the present war. During an engagement when an officer was seriously wounded, Private Farrell with others risked his life under heavy shell fire and rescue the wounded officer, whom he conveyed to where his wounds could be dressed. Private Reuben Farrell is the eldest of three brothers who have served in the army during the present campaign, but, unfortunately, the second eldest (John), a sergeant in the Royal Irish Rifles was accidentally drowned on the 5th of March last in the river Lys, and Thomas, the youngest, a lance-corporal in the Royal Irish Fusiliers, has been discharged through wounds received at Armentières. These soldiers are the sons of Mr. Christopher Farrell, photographer, Clones. Fermanagh Herald July 10th. 1915. BRIDES IN BATH CASE. SMITH FOUND GUILTY. PRISONER’S OUTBURST. The trial of George Smith for the alleged murder of Bessie Constance Annie Mundy in a bath at Herne Bay, came to its ninth and final hearing today. As in all great murder trials, public interest increased as the case reached a climax and this morning the court was besieged by a crowd of people anxious to be spectators of the last dramatic scenes. Mr. Justice Scrutton, before he commenced his summing up, had to order the fastening of the doors, saying that enough people were already accommodated in court. Most of the spectators were women. Fermanagh Herald July 10th. 1915. THE LORD LIEUTENANT AS AN ANGLER IN BALLYSHANNON AND BELLEEK DISTRICTS. On the 28th ult. his Excellency the Lord Lt. of Ireland fished the river and caught one salmon and lost another from Ballyshannon Bridge. His Excellency left Cliff for Dublin on the 29th ult and is expected back on the 8th inst.. The three gillies employed by the Lord Lt. fished the river for salmon throughout the week, and caught salmon and grilse from 6lbs to 13lbs. Messers. Glynn and Stone had similar captures of salmon and grilse, as recorded in last Wednesday’s issue. Sea trout anglers fishing down the estuary and below Assaroe Falls enjoyed fair sport. Mr. Sweeney took a bag of 13 sea trout on the 28th ult. – largest fish 4lbs. Mr. Hildebrand and a friend had a similar bag of trout on the 29th ult, largest fish 3½ lbs, and several other good catches were taken. Lough Melvin, for the week ending the 3rd inst. – Sport among the trout continued good and many bags of gillaroo and sonaghan and trout were taken by anglers daily, containing from 15 to over 20 trout. Mr. Burns had a bag of 15 trout, weighing 12 ½ lbs, on the 29th ult, the largest three fish gillaroo trout, 2lbs each, and 1 ½ lbs. Mr. A. and Mr. F. Crawford had several good bags of trout on the first, second and third inst. Amongst them were a number of gillaroo trout from 1lb to2lb each. Fermanagh Times July 15th, 1915. FRICTION AT LISNASKEA. For a period extending not over weeks or even months, but actually over years there has been what looks uncommonly like a feud going on between the officials engaged in Lisnaskea Workhouse and Infirmary, respectively, with results most prejudicial to the efficient and harmonious workings of those institutions. First, it is about one thing and then about another; the most trifling incident is magnified into a matter of grave importance and continuous friction and heat and a want of cooperation between the officials concerned is the natural and inevitable result. It is time this was finally stopped. Half measures and warnings have already been tried in Lisnaskea and have proved a complete failure. Drastic measures are now absolutely necessary. Into the merits of the present dispute it is not our intention or province to go. The Master, (Mr. Lunny) virtually, and in fact called Nurse Power a liar, and she returned the compliment. Suffice to say that two weeks ago the Master made somewhat serious charges and said he would prove them if given an opportunity to do so. The Guardians took him at his word and appointed Saturday last for the purpose, but when asked to fulfil his promise the Master failed to do so. Now, these charges are either true or untrue. If true then the nurses against whom they were made should be held responsible and strong action taken regarding them but if untrue then the Master should be called upon to retract them and apologise as well as to give a satisfactory explanation as to why they were ever made. The position at present is unsatisfactory to all parties and if allowed to pass will only result in a fresh ebulition of temper and recrimination in a short time. Fermanagh Times July 15th, 1915. THE “TWELFTH.” Monday it was only a ghost of a “Twelfth” as we have been accustomed for generations to know it. Only in the neighbourhood of Belfast were there any processions, and as neither drum was heard nor flag was seen at these they were most unlike their musical and picturesque predecessors. In Fermanagh here we had not even a silent and colourless parade. We obeyed strictly the wish of the Grand Lodge that the historic anniversary should be observed solely by special services on a the Sunday in the Churches. Great congregations of the members of the Orange Institution, wearing their sashes attended Divine Worship and listened reverently to the Word and the Gospel discourse had a direct application to the famous events that naturally filled their minds. But on the 12th the work-a-day was much as usual. In the town there was no cessation of business; in the country, farmstead’s and field monopolised attention. Fermanagh Times July 15th, 1915. WAR PROSPERITY. AMAZING DISCLOSURES. “A pound a week and no husband to keep! Why its Paradise – I tell you ma’am this war is too good to last.” (Working woman’s remarks quoted by the Lady Seely, The Times, the June 10, 1915. Any man who can crawl out of the workhouse can get well-paid work today. (Master of a big London workhouse.) The working woman was right. Never were there such times for the working people of this country. The little chance points emphasized above are but few among scores that might be quoted, all tending to show that the prosperity of the working classes through the war is, for the moment, such as has never been touched in the history of the country. But one thing on a moment’s consideration is apparent. £21,000,000 a week is being spent by the government for war purposes. To the ironworking families of the Clyde, were a father and son may bring home £20 a week between them; to munitions making families of Birmingham, where a family income of £30 a week is not unknown; to the woollen and clothing families of Yorkshire, where every boy or girl can now find a place in mill or factory; to the ammunition makers of Woolwich and district, where boys of 17 years can afford to turn up their noses (and have done so) at wages of 27 shillings a week – what is the increased cost of living to these lucky people? And a there are many such. Fermanagh Times July 15th, 1915. FROM THE FRONT TO CLONELLY. Mr. Harry Hart, a stepson of Mr. Folliott Barton, J. P., Clonelly, and who is at the front with King Edward’s Horse, writing home to his mother says – 2nd K. E. H., June 25? 1915. My Dear Mother, – We are back in billets again. Came out last night 24th and had a walk of about 5 miles to a village where we were billeted in some houses and had a most enjoyable sleep on flags, free from the sound of even our own guns, which was something of a relief. No one is keen to know what is going to happen, but we are moving further down the line for some reason or other. I had a funny experience last night, as the first thing we do when we have a rest is to go and look for coffee and something to eat. Another chap and I walked into a house, and he asked in his own good French if we could get some coffee. The ladies’ reply was, “No, my boy, we have no coffee, but we have some tea on especially for you.” You should have seen the look on that chaps face. I don’t know what mine was like. It turned out she was from Southampton and was a governess out here, and it also turned out that we had a good time. I can tell you we weren’t sorry to get out, six days at that the redoubt was quite enough. You can’t exactly keep clean when you are in the trenches no matter what you do. We were very lucky as our troop got out without any casualties for the week. There was something doing the last day we were there –the bally Huns put up three mines, but they all missed. One went up close to us, and I was lucky on being on the lookout just when she went up and let me tell you if you had been on the top of it you would have had a good ride for your shilling a day. Strange to say we heard no report. I was waiting to get knocked over with the report after I saw the splash. July 2 1915 My Dear Mother, -we are shifting out tonight up to the front line for four days and then four days on the reserve – that I believe is the programme. So if you don’t get a letter for a few days you will know everything is OK. The trenches here are an easy thing; very little doing they say. Last night the Germans sent up about a dozen shells over our way and we counted seven squibs – don’t know whether their munition is getting bad or the wet ground was the cause of it; I hope the former. The weather round here has been rotten lately, it won’t rain and it won’t keep decently fine. Have struck a better part of the country here, the people are much better, and most of the children talk English some of them very well; they teach it in the schools. Fermanagh Times July 15th, 1915. OUR LITTLE WARS. NYASALAND SKIRMISH. HOW A FERMANAGH AN OFFICER, LIEUTENANT IRVINE WAS KILLED. The British forces were composed of 50 Northern Rhodesia police and 25 Northern Rhodesia Rifles as they attacked an enemy stockade that was raiding Nyasaland villages under British protection. The attacking party, under Lt. Irvine, rushed the gate of the stockade with great bravery and immediately heavy firing started. Irvine was shot and the bullet entering his left arm blew away about 4 inches of bone. Sergeant Mills got to him first, and, although nearly dead from loss of blood, Irvine said “Leave me, Mills, leave me and take charge of the men. As the poor fellow was carried away he smiled and waved his right arm in farewell. He was operated on next morning his arm being taken off and died that night. The fighting was all over in 20 minutes. Lt. Irvine was a brother of Major Irvine, D. L., of Killadeas and of Mr. Geoffrey Irvine, Goblusk. Impartial Reporter. July 15 1915. TRILLICK RURAL COUNCIL met on Saturday and discussed extracts from the last report of Dr. Stephenson, medical inspector. In it he referred to common lodging houses not being registered; town pump not in repair; no sewage system in Trillick; no bylaws under the Public Health Act; and no efficient disinfecting apparatus. A deputation from the road contractors in the district appeared and asked for either an increase in the amount of their contract or a reduction in the amount of road metal, owing to the increased cost of labour and material. Impartial Reporter. July 15 1915. DERRYGONNELLY. Mister J. Nixon of Cosbystown, was almost killed by his own bull on Friday. Mr. Nixon was driving his cattle from one field to another when the animal attacked him. Mr. Nixon held him for a long time by the horns and was getting exhausted and fell upon the ground when Mr. R. Armstrong and his brother John arrived, and drove off the infuriated brute. Impartial Reporter. July 15 1915. BELLEEK FARMERS SUICIDE. An inquest has been held on Friday by Mr. George A. Atkinson, coroner for North Fermanagh, on the body of John Dundas, farmer, of Killybeg, Belleek. Deceased, who was unmarried, and was aged 65, was found sitting on his bedside with his throat cut by a razor. He was then dead. Dr. Kelly Belleek stated that he had treated the deceased his mind had been overbalanced. The jury returned a verdict of suicide during temporary insanity. Impartial Reporter. July 15 1915. AT DERRYLIN PETTY SESSIONS, before Dr. Irwin, R.M. (in the chair), W. G. Winslow, A. Burns and Thomas Bullock, justices. District inspector Marrinan charged a man named Francis Reilly, of Derrylea with seriously assaulting one Peter Gunn. The depositions of Gunn were read that on the 9th of June he was assaulted by Reilly with the result that he had to go to Enniskillen hospital for treatment. He declined to prosecute and the District Inspector said he had a summons issued against the defendant for a common assault. Gunn, the injured man told the District Inspector that he was better and nothing the worse of his injuries. Peter Gunn swore that on the evening in question at about 9.00 he was standing at the Derrylea crossroads when Reilly came up and asked them was he as good a man as he was yesterday. Witness said nothing and Riley started to use his feet and hands on him. He was knocked down and kicked in the private parts. He felt weak and was attended by a doctor who had him sent to Enniskillen hospital. He did not believe there would be any repetition of the assault. Defendant admitted the offence and the chairman in cautioning him said he was getting off very lightly for a fine of five shillings. Impartial Reporter. July 15 1915. THE TWELFTH – A DRUMLESS CELEBRATION. In the ordinary course of events the anniversary of the battle of the Boyne would have been celebrated with all its old time ceremonial on Monday last, but owing to the present Great War, all demonstrations were vetoed, and the only outward celebrations by the orange brethren were the church parades in various parts of the country. It was a drumless Twelfth No bands paraded to herald the anniversary, no drums sounded as the flags were hoisted on the churches. The flags this year were in most cases Union Jacks instead of the Orange and Blue. Fermanagh Herald July 17th. 1915. A BELFAST EXTERMINATION CAMPAIGN. THE CORPORATION SERVES EVICTION NOTICES ON 160 POOR FAMILIES IN WEST BELFAST TO DISENFRANCHISE SOLDIERS. Writing to the Irish News Mr. Joseph Devlin, M.P. for West Belfast says “I wish to call attention to what I think will be admitted to be one of the most outrageous transactions which have ever disgraced any community, and which, I am sure will shocked people of humane and patriotic instincts in every part of the United Kingdom. In one small area of West Belfast steps have been taken by the Corporation to throw out on the roadside some 160 poor Nationalist families, who owe no rent, and scarcely one of which is not represented in the Army by one or more members. It is safe to say that, outside the Unionists of Belfast, there is no political party in these countries who would take advantage of the present unparalleled national situation to perpetuate such an outrage. On Thursday last, by order of the Public Health Committee of the Belfast Cooperation, which is dominated by two leading members of the West Belfast Unionist Association, 160 families in a small and very limited area of West Belfast were served with notices to quit. This order was made at a meeting not called for this purpose, but, as the notice states to consider the supply of coal to a local asylum. The notices are served to terminate the tenancies on July 19th, so that the votes of the absent soldiers would be lost, because they would not be in possession of their houses has tenants on July 20th, the last day of the qualifying period and they or their families would be unable, even if other houses where available, which they are not, to get into other houses in time to preserve their franchise. This makes the motive of the notices to quit tolerably clear. Fermanagh Herald July 17th. 1915. THE WELSH COAL CRISIS. DRASTIC GOVERNMENT DECISION. It has been decided by the government to put down the threatened Welsh coal will strike, under the provisions of the Munitions of War Act. The proclamation, which will be issued on Wednesday, will have the effect of making it an offence to take part in a strike or lockout unless the difference has been reported to the Board of Trade and the Board of Trade have not, within 21 days of such report, referred it for settlement by one of the methods prescribed in the Act. The announcement in Parliament was received with cheers. Fermanagh Herald July 17th. 1915. IT IS WITH SINCERE SYMPATHY that we announce the death in action of Private John Spillane, Head Street, Enniskillen, while serving with the British Mediterranean Expeditionary Force. Deceased leaves a widow and four small children to mourn his loss. Sincere sympathy is extended to the deceased’s father and his wife and other relatives in their sad loss. Prayers were offered up for the repose of his soul in St., Michael’s church on Sunday. R.I.P. LIEUTENANT CHRISTOPHER T. C. IRVINE, OF THE INDIAN ARMY, who belonged to a well-known Fermanagh family, was killed at the Dardanelles a few days ago. He was the younger son of the late Inspector General G. J. Irvine, R. N. and brother of Mr. Charles E. Irvine, Drumgoon Manor, Maguiresbridge, Co., Fermanagh, and Enniskillen whose two sons are serving their country. In 1909 he entered the army as a second lieutenant in the Connaught Rangers, transferring three years later to the Indian army, and being attached to the 25th Punjab Cavalry. His eldest brother was wounded at an early stage of the war. Fermanagh Times July 22nd, 1915. RECRUITING DEMONSTRATIONS IN FERMANAGH. GOOD GATHERINGS IN PETTIGO, BALLINAMALLARD AND LISNASKEA. On Tuesday the recruiting party with their band visited Pettigo. The weather conditions were very unfavourable, but as it was a fair day there was a large crowd in the village. The meeting was held in the open the speakers addressing the crowd from a wagonette drawn across the roadway. Very little enthusiasm or concern was displayed by the crowd who gather round and it took little to distract their attention from listening to the words of warning and appeal of the various speakers. During the speech of Lieutenant Kettle, Professor in the National University, and one of Ireland’s foremost orators, a car was passing down one side of the broad street and the majority of the farmers, dealers, and labourers present turned and watched it, and for the time being seemed more interested in its progress than in the spirited words of the speaker. As another speaker Mr. Lloyd, of Dublin was speaking a man who was bringing some sheep along the street drew the attention of a section of the audience. There were many who were impressed by the speakers but the general demeanour of the crowd bore eloquent testimony to the fact that in that district at any rate the seriousness of the situation and the peril of the country is little understood. Impartial Reporter. July 22 1915. ENLIST NOW. A BIG RECRUITING RALLY THROUGHOUT COUNTY FERMANAGH. THE ORANGE AND GREEN UNITE WITH A STIRRING ADDRESS BY LIEUT. KETTLE AND HE IS CHEERED BY ORANGEMEN. There was a large crowd at the recruiting meeting held on yesterday Wednesday afternoon at Lisnaskea when Mr. J. Porter Porter, D.L. occupied the chair. On the platform were men of all shades of politics and religion as the chairman appealed for young men to join the ranks and help to keep their country free. They would have a speech from Lieutenant Kettle, one of the leading lieutenants of Mr. John Redmond. He was a good fighter, and he would go and fight the Germans with them and when the war was over he would be glad to fight Lieutenant Kettle himself. (Cheers.) Lieutenant Kettle, in describing German atrocities, said that when the war began he was in Belgium and he would tell them a secret that had not yet been told in the Press. He was over there engaged running rifles for the Nationalist Volunteers and he was proud to say he got them into Ireland. He had this claim on Ireland: he represented for a time East Tyrone and when he left the Orangemen made him a presentation; one of the few he ever got in his life. (Cheers.) The evening before he had been addressing the Ballinamallard Orangemen and in all his experience he had never got a better hearing. Party politics were now aside, and in Flanders and the Dardanelles there was no question of religion. Fermanagh Herald July 24th. 1915. THE DARDANELLES. CASUALTIES TO THE END OF JUNE. In the house of commons Mr. Asquith said the total casualties sustained by both naval and military forces in the Dardanelles to the end of June were as follows: – OFFICERS – killed 541, wounded, 1,257, missing 135. Total 1,933. MEN – killed, 7,543, wounded, 25,557, missing 7,401. Total 40,501. Fermanagh Herald July 24th. 1915. NO PROFESSIONAL FOOTBALL. The Football Association Council have decided that no international matches or matches for the Challenge Cup or Amateur Cup of the Association, will be played next season, that no remuneration shall be paid to players, and that there shall be no registration of players. Association leagues and clubs can arrange matches to suit local conditions but such matches must be without cups, medals, or other rewards, and must be played only on Saturday afternoons, early closing days, and recognized holidays. Fermanagh Herald July 24th. 1915. THE KAISER’S FINANCES. The Paris Newspapers, says a Press Association War Special, publish a letter from a private source received in Rome according to which the Kaiser is reported to be in a very precarious financial situation. The war has already cost him 100,000,000 marks and other German Princes are also very embarrassed pecuniarly. Fermanagh Herald July 24th. 1915. LISNASKEA MAN KILLED AT THE DARDANELLES. Mrs. McFarland of Lisnaskea has been notified that her son James a private in the Inniskilling Fusiliers has been killed at the Dardanelles. He had only landed two days before. Fermanagh Times July 29th, 1915. PANDEMONIUM IN LISNASKEA BOARD ROOM. THE CHAIRMAN’S EXTRAORDINARY ATTITUDE. INSULT HURLED AND BLOWS THREATENED. The liveliest spot in Fermanagh on Saturday was undoubtedly the Boardroom of the Lisnaskea Workhouse during the progress of the weekly meeting of the Board of Guardians. The scenes enacted there were both regrettable and unnecessary. Lisnaskea has of late loomed rather large in the public eye owing to serious disagreements which have taken place there between officials and now apparently the querulous discontented spirit that apparently prevails in the internal management of the workhouse and infirmary has communicated itself to some members of the Board which is responsible for administering the affairs of the whole Union. The present cause of strife is the appointment of a Medical Officer for Maguiresbridge Dispensary District, which position has been rendered vacant by the resignation of Dr. Thompson, whose application for a slight increase in salary, it will be remembered, was refused by a majority of the Board. Since his departure it has been found impossible to procure a successor at the meagre salary of £80 a year with the result that a very wide and populous area of the County has been left without the services of the resident dispensary doctor. What to do under these circumstances is a question that has been exercising the minds of the Guardians for the past month or two, and finally they came to the somewhat Quixotic decision that rather than pay a resident doctor £100 a year they would prefer to pay a locum tenens £130 pounds a year, for to visit the dispensary each week. This appointment is to be for an indefinite period as they decided not to re-advertise the vacancy. A peculiar situation has thus been created, which has naturally given rise to a considerable amount of feeling throughout the Maguiresbridge District and has been the cause of much heated controversy among the members of the Lisnaskea Board. This culminated on Saturday in a condition of things which our reporter describes as chaos. Fermanagh Times July 29th, 1915. THINGS PEOPLE WANT TO KNOW IN DIFFERENT FERMANAGH DISTRICTS. How many people in Fermanagh are now learning the Irish language? And if the craze, so popular among certain classes a couple of years ago is not now obsolete so far as this district is concerned? If the large band of slackers belonging to the Ballyshannon Irish Nationalist Volunteers who paraded Bundoran streets on Sunday heard the pitying and contemptuous remarks which were made by all sections of visitors regarding them? And if all these men, the great majority of whom were of military age, should not have felt ashamed to be seen parading their cowardice in the public streets in such a conspicuous manner? What will the next row in Lisnaskea be about. If the habit of some young ladies of utilising public entertainments such as that given by Mr. Brown–Leckie in Bundoran, on Monday night, to personally approach members of the audience, about whose private circumstances they know nothing, and urge them to join the army is not most reprehensible and should not be tolerated? And if such mistaken tactics do not do a great deal more harm than good to recruiting. Fermanagh Times July 29th, 1915. THE MEETING OF THE ENNISKILLEN PRESBYTERIAN CONGREGATION TO ELECT A CLERGYMAN FAILED TO DO SO. A meeting of the members of the Enniskillen Presbyterian Church qualified to vote was held on Monday night to elect a successor to the late Rev S. C. Mitchell. There are 47 members so qualified, but only 39 of these were present. The chair was occupied by the Rev John Wilson, Tempo. The first query put to the meeting was – are you prepared to make a call to a particular minister or licentiate? To this there was a conflicting response, and on a vote being taken 25 answered in the affirmative and 13 in the negative. One did not vote. Then came the inquiry – who is the minister or licentiate you propose to appoint? The minister or licentiate named in answer to this demand would require a 2/3 vote to insure his acceptance, and as it was evident from the previous vote that there would not be a 2/3 majority for any individual no response was made. This was the more significant because if a name had been mentioned and the clergyman nominated did not secure the 2/3 majority he would have been disqualified from any for their candidature in the election. Matters where thus, so to speak at the deadlock. In such an eventuality General Church Regulations require a list to be prepared out of which a selection can be, after due care and trial, subsequently made. Accordingly, the Moderator declared that a list should be now opened and asked if any present who had a clergyman to bring forward should now name him. Whether the name would be allowed to go on the list was subject to a vote. The Rev Mr. Jenkins, who had charge of the pastorate during the Rev Mr. Mitchell’s absence in Italy was then proposed and passed on to the list. Several other names followed but the 25 who voted solidly at the earlier stage of the proceedings steadily vetoed every one of them. The result was that the meeting, which was pretty animated at times, was adjourned for a fortnight, when it is hoped that the good sense of the congregation will find some means of coming to a united and wise decision. Fermanagh Times July 29th, 1915. BUNDORAN. 100 YOUNG MEN, WHY DO THEY NOT ENLIST? Bundoran, where holidaymakers of both sexes were in scorers, was visited by the recruiting party on Friday. The meeting, which was held from a wagonette drawn up just outside Mr. Rennison’s establishment opposite the Station Road, was largely attended – women being in the majority. The day was bright and bracing and speeches, having as their object the enrolment of men to do their share amid the shot and shell and carnage of France and Belgium seemed out of place in this peaceful seaside resort of South Donegal. So serious, however, is the situation in which the Country and Empire is placed that every corner of the land must be reached and every man, and woman too, called upon to do something in defence of the liberties which they enjoy under the British Constitution. Every speaker was accorded a patient and attentive hearing. The members of the gathering gave evidence every now and then of their appreciation of the arguments placed before them concerning the necessity for more men, but, we understand that there was not one to offer his services at the end of the meeting. Fermanagh Times July 29th, 1915. BALLYSHANNON. A PRIEST A DECLARATION AT THE RECRUITING MEETING. From Bundoran the party motored to Ballyshannon where a meeting was held at 7.00. The most noticeable feature of the crowd here was the very large number of physically fit young men who attended it. There must have been nearly 200 men of military age around the motor car and from which the speakers addressed the meeting. The parish priest, Rev Canon Rogers, presided, and made one of the strongest and most sincere appeals we have heard during the tour. The Canons fine personality and convincing delivery is lost in the retelling of what he said, but we give his remarks almost in full, because they are the words of a gentleman of learning and distinction, whom the people of the district greatly respect and esteem The band of the 4th fourth Inniskillings as usual played selections of lively areas and the speakers were given a respectable hearing. But there were no recruits at the conclusion. Fermanagh Times July 29th, 1915. DERRYGONNELLY. At a recruiting meeting in Derrygonnelly it was said that it had sent more to the army out of its population of 212 than any small town in Ireland, and in proportion to its population Derrygonnelly had more men killed and wounded than in any other town or city in Ireland. (Cheers). After the meeting the speakers and the band were entertained to luncheon by the local committee of which Mr. C. Parke is the capable Secretary. Fermanagh Times July 29th, 1915. PETTIGO AND RECRUITING. Rev T. C. Magee, The Rectory, Pettigo, writes: – I wish at once to correct the false impression left in the minds of the readers of the Fermanagh Times concerning the number of young men who have enlisted from Pettigo. Up to the present 42 young men from the district of Pettigo have joined the colours; a number which I think he’s very creditable considering the scattered population of the neighbourhood and the smallness of the town. Colonel Leslie has held recruiting meetings in Pettigo on the fair days during the last four months and there was no great flourish of trumpets at these meetings or newspaper reports, although they were worthy of some notice. There was no expense incurred yet after each of his appeals and for days after young men went off to Enniskillen, others to Derry and a few to Belfast to enlist. Impartial Reporter. July 29 1915. PRIESTS IN THE IN THE TRENCHES. MASS AND CONFESSION IN THE OPEN. Rev. J. Gwynne, S. J. Chaplain attached to the Irish Guards who was wounded some time ago in the course of a letter to Dr. M. Garvey, Tunaderry, says he had a narrow escape and it was prayer that saved him. The last thing he remembered was seeing the Guards get to the top of the ridge, when a lurid red blaze seemed to flash into his eyes with a deafening crash. He was hurled back some 5 yards or so and lay unconscious for some minutes. When he came to he felt his face all streaming with blood and his leg pained him. He was suffocated two, with the thick, warmly, vile gas, which came from the shell. “A doctor bandaged me up and I found I was not so bad and in an hour’s time when everything was washed and bandaged, I was able to join and give Extreme Unction to a poor Irish Guardsman who had been badly hit. When in the trenches I see any wounded man immediately he’s hit and give him the last Sacraments. Then I hear the confessions of the men in the trenches, in their dugouts. I can tell you it is easy to have contrition when the air is simply alive with bullets and shells. Father Gwynne in a further letter tells of strange events. One man he was called to had been shot through the throat and made his confession by signs being unable to speak. He had to crawl out flat to a Coldstream Guardsman who was shot through the head and give him the last Sacraments. Impartial Reporter. July 29 1915. TWO RUFFIANTLY SOLDIERS DISGRACE THEIR UNIFORMS BY ASSAULTING CHRISTIAN BROTHERS. Private C. E. Gillespie and Private Betts, 9th Batt. Inniskilling Fusiliers (Ulster Division) were sentence at Ballycastle Petty Sessions to two months imprisonment with hard labour for an assault on Christian Brothers. Rev. Brother Craven said when taking a walk on Saturday evening with Brother Conway on the road leading to the Catholic Church he passed some soldiers belonging to the Inniskilling fusiliers who were cursing the Pope and uttering blasphemous language. It was said they never saw a more ferocious and violent crowd than these soldiers. After a severe beating they eventually escaped by running into the church. Impartial Reporter. July 29 1915. AT A COURT MARTIAL EVIDENCE WAS TAKEN and Lieutenant Colonel C. Lawrence Prior pleaded not guilty to inviting several officers to a gambling house to the prejudice of good order and military discipline. Evidence was given by a number of officers mentioned in the charge that on February 17 the accused invited his brother officers to dinner in the Café Royale to celebrate his coming promotion. Towards the end of dinner accuse received a note from a man who was dining at another table and a little later said to his guests, “A fellow has asked me to come and have drinks in this house and there may be cards. I am thinking of giving £100 a run. What about you fellows?” Five or seven officers accepted the invitation and went to a house where they played chemin de fer with two men, one of them spoke with an American or Canadian accent the latter winning a considerable amount of money. Captain Gibson thought that all of the party had lost money and considered the game was not properly played. Fermanagh Herald July 31st 1915. SAD OCCURRENCE NEAR GARRISON. FARMER’S TRAGIC DEATH. Writing on Tuesday at Derrygonnelly a correspondent says: – A well to do farmer named P. McManus, who resided at Rogagh, about 8 miles from here in the Garrison police district, shot himself dead on Monday. The facts to hand are as follows: – McManus visited Belcoo on Monday to purchase some provisions and returned back to his home. When he entered the house there was a man named Burns in it. He took down a gun and asked Burns to go out to the mountain to have a shot. Burns decline to go and he went himself, bringing the gun with him. He had only gone a few perches when he sat down on a ditch. He was afterwards discovered lying dead as the result of gunshot wounds to the head, which appeared to have been self-inflicted. McManus, who was well known, leaves a wife and two small children to mourn his loss. This entry was posted in Uncategorized and tagged Ballyshannon, Barton, Belfast, Belleek, Bundoran, Clonelly, Clones, Colonel Leslie, Crom Castle, Dardanelles, Derrygonnelly, Derrylin, Donegal, Enniskillen, Fermanagh, Inniskillings, Irvine, Lisnaskea, Pettigo, Presbyterians, Priests in the war, Recruiting, Sir Ian Hamilton, Submarines., The Twelfth, Trillick, Victoria Cross. ← A BIT OF BUNTING. BY A WOUNDED ANZAC. 1916.